Working class people face huge challenges at work and in our communities. We have endured decades of high unemployment, deregulation, anti-union legislation, privatisation, cuts and outsourcing, alongside an inadequate response from our unions. Many have felt powerless and vulnerable as our jobs, pay and conditions, services and rights are attacked. Yet workers continue to resist, and when we do, we usually achieve some measure of success. Workers create all the profits, and we have enormous power – if we have the consciousness and organisation to use it. The low turnout and lacklustre results of the senior officials standing in the Unite elections earlier this year showed that there is a large and growing disconnect between our union’s leadership, structures, and members. They also showed that a significant minority of members want to see a more radical, robust and bottom-up response to the challenges facing us – just as the response to Jeremy Corbyn shows that millions want something more than a fresh gloss on the same old free-market fundamentalism. There is a widespread desire for a more democratic culture, where discrimination is not tolerated. This is essential if we are to maximise involvement in building a strong union. 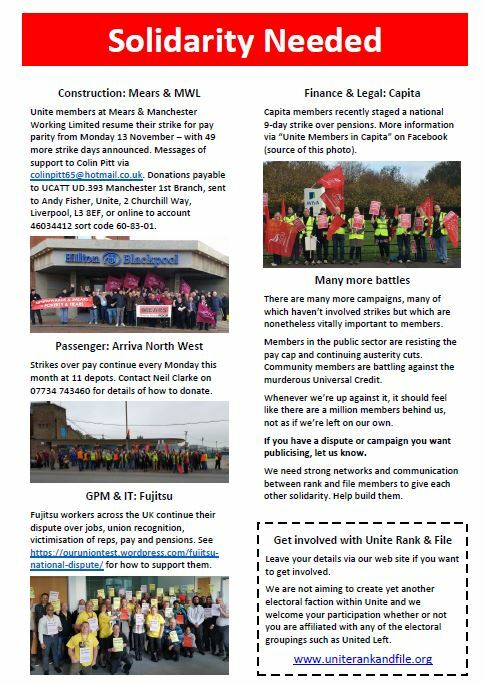 While the impetus for the new grouping came out of the campaign to elect Ian Allinson as General Secretary, we are not seeking to create yet another electoral faction within Unite. We welcome your participation irrespective of your views on the recent elections or whether or not you are affiliated with any of the electoral groupings such as United Left. Please leave your details if you want to get involved. As well as our web site www.uniterankandfile.org you can also follow us on Twitter @UniteRankNFile and like our Facebook page @UniteRankAndFile.